Cyber-Criminal Threats – Cyber-Crime is an International Legal problem that has no short term resolution. There will always be someplace in the world that is a harbor for cyber-criminal activity. 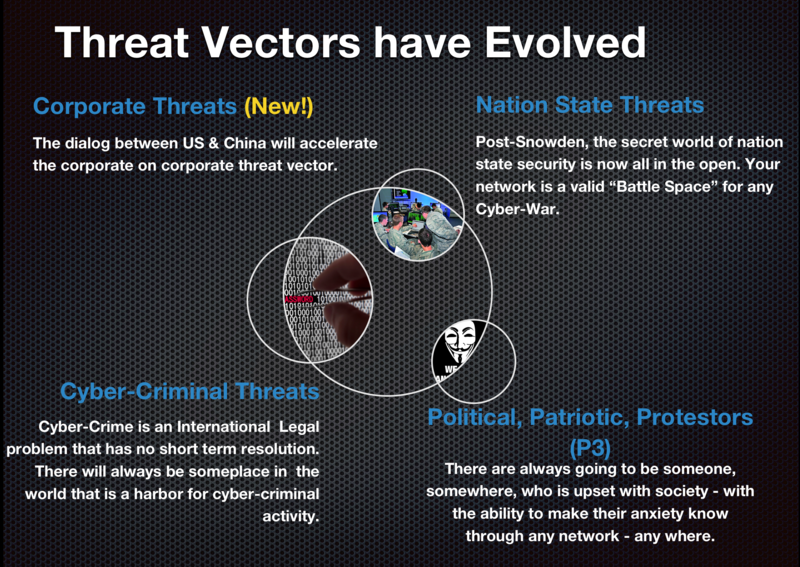 Nation State Threats – Post-Snowden, the secret world of nation-state security is now all in the open. Your network is a valid “Battle Space” for any Cyber-War. Political, Patriotic, Protestors (P3) – There are always going to be someone, somewhere, who is upset with society – with the ability to make their anxiety know through any network – anywhere. Corporate Threats (New!) – The dialog between US & China will accelerate the corporate on corporate threat vector. Beware! DNS Changer IP Blocks are re-allocated and advertised! Flashback Malware – Check your MAC Now! Are you one of the 500,000?